1.) I am not a critic of any genre in any way, shape, or form. I’m just a fan of The Walking Dead. I won’t always look for deeper artistic meaning. I will however look for character development. I am particularly interested in that aspect of TWD. After all, you can get zombies in a thousand different places, but you don’t always get good characters along with them. 2.) I am a Norman Reedus fan girl. There it is... my secret is out. (OK, so it wasn’t a secret to anyone who has seen my Facebook page.) I was vaguely aware of him as an actor before TWD, but as Daryl Dixon became my favorite character, I began to look at the actor more closely and was impressed with most of what I saw. Doesn’t mean I won’t call out what I see as bad acting, but I will be more willing to forgive. Get over it or read someone else’s blog. As you might imagine - based on point #2 above - for my first entry, I will be talking about the five primary reasons that I like Daryl so much and why it is that I like the way Reedus plays him. First: Daryl is a wild card. Since he’s not in the graphic novels, there is no back story for him and we have no idea what direction he might ultimately go. Plus, he is a powder keg holding his own lit match so no one knows how he's going to act/react in a given situation. While I sometimes like characters because I “know” them and what they will do, there is no such familiarity or comfort in Daryl. He keeps me on my toes. Second: Daryl is Mr. Practical. A good example is his omnipresent crossbow with its advantages of silence and reusable ammunition. A better example is Daryl’s absolute lack of sentimentality about walkers and the fact that they used to be humans. While others have mixed feelings about this point, Daryl has no emotional garbage getting in his way. He was ready to shoot Amy before she reanimated and take a pick axe to Jim before he was even dead. You don’t get more practical than that. Third: Daryl calls it like he sees it. There are numerous examples of this. In season one after Rick draws down on Daryl – who is about to take that pick axe to Jim - and says “We don’t kill the living,” Daryl’s immediate response is “That’s funny, coming from a man who just put a gun to my head.” In season two when Andrea wants him to shoot the walker swinging from a tree branch, Daryl tells her “He made his choice; let him hang.” Part of being Mr. Practical is being Mr. Brutally Honest. I want a character to be honest with himself and with me as the viewer. I also want a character that says what I am thinking and Daryl often does just that. Fourth: Daryl is decisive. He is the most likely of the group to shoot first and ask questions later. In a zombie apocalypse, that’s a good thing. This is probably what I like most about Daryl. In any situation, real life or fictitious, I want to know the guy with me is going act without hesitation and with extreme prejudice to eliminate any threat to my safety. Not that I’m not capable of shooting a walker myself – no shrinking violets allowed when the dead roam the earth – but it would be good to know that someone’s got my back. Reedus does a good job portraying these larger aspects of Daryl but he does an even better job at the small details that offer insight into Daryl’s personality. Now, how much of that results from how a director blocks scenes and how much is Reedus’s interpretation of Daryl, I can’t say. Of course the lines are the work of the writers, but some of the small body language may very well belong to Reedus alone. Regardless, there are several seemingly minor things I’ve noticed that I think help to build our understanding of Daryl. The cracking voice and almost tears that I mentioned earlier are two of them. Add to that the squints and glares and it’s obvious that the only emotion Daryl is completely comfortable with is anger. The rest are new territory for him. Last season, when the group left Jim at the side of the road, everyone went to say goodbye. Not Daryl. He stood off a bit and after everyone else was done he just gave Jim a nod and walked off. That nod acknowledged that Jim made his choice and Daryl respected that. (Reedus has said that this was not in the script but how he wanted to play the scene in order to keep Daryl consistent. After all, Daryl had just come close to putting a pick axe through Jim’s head earlier that morning.) This season while at Otis's memorial, everyone is standing with their hands clasped in front of them, looking sad. Not Daryl. He stands with his arms crossed and a look on his face that says "Let's get on with this; I’ve got a little girl to find." 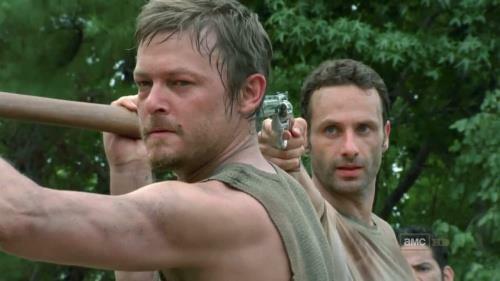 His posture sets Daryl apart from the others and tells us that while he is in this group, he still isn’t a part of it. For the most part, the writers are being consistent with Daryl’s character development and are doing it without pushing the character too quickly. We see a little more humanity in him each episode. Guys like Daryl don’t change in just a few weeks, not even when zombies are shambling around. Reedus has said in interviews that the writers have given him some say in Daryl’s character development. This is wise on their part because an actor makes you believe in a character most when he is part of the process in creating the character. I hope that process continues, but please don’t take away too much of Daryl’s edge. I’d hate to get too comfortable with him. Awesome read and I agree with all of it. You make a lot of very good points here! I like how you mentioned "The cracking voice and almost tears that I mentioned earlier are two of them. Add to that the squints and glares and it’s obvious that the only emotion Daryl is completely comfortable with is anger." You are bang on with that, Daryl does only seem to be comfortable with anger. I can't wait to see how he changes when Merle is back on the scene! What can I say.... Other than, AWESOME post Lisa!!! Congrats!! Anger is often a mask for one of two other emotions that people don't want to face: 1.) Depression or 2.) Pain. This is especioally true when people rage like Daryl sometimes does - remember his near breakdown on the roof after they got back there but Merle was missing? That wasn't anger - although it looked like it - that was pure animalistic pain. I agree on all points minus #4 - Not sure Daryl would have shot Otis, in fact - I am sure were it Daryl on that mission, Carl, not Otis would be dead. just read your blog, and I agree with it, especially on the minute details that Reedus gives on the characther of Daryl. I most especially love the scene where Carol gave Daryl an appreciative kiss on the head, which he tries to block at first. It shows that his characther is not at ease with expressing feelings, and that he was still trying to act as if he does'nt care. I really appreciate Norman Reedus' efforts for this characther, whom I do love so much! Awesome blog with great insights. I also love the little things Reedus does to enhance the character. I took the flinch he did when Carol tried to give him a kiss as an instinctive reaction to someone coming in close to hit him. As in, no one has ever shown that kind of kindness to him, only violence. I can't wait to see how Daryl reacts to Sophia's death. He is the reason I watch the show. The best character by far! Truthfully said! Well prepared! Agree with you 100% We Love Daryl! Lisa that piece was brilliant. I think your point four (shoot first ask questions later) possibly explains why he was so quick to forgive Andrea. I also notice the cracks in the voice and his hiding of his emotions (of fear and bereavement).